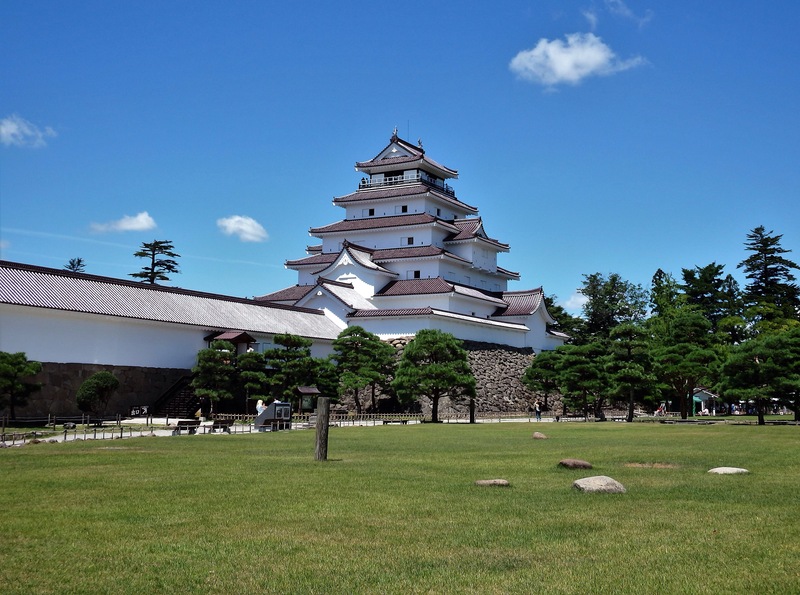 Aizu Wakamatsu is located in the center of Fukushima Prefecture and is nicknamed the ‘Samurai City’ due its prominence as a former castle town of the Aizu domain. The city is full of impressive historic sites and is one of my favorite sightseeing destinations. 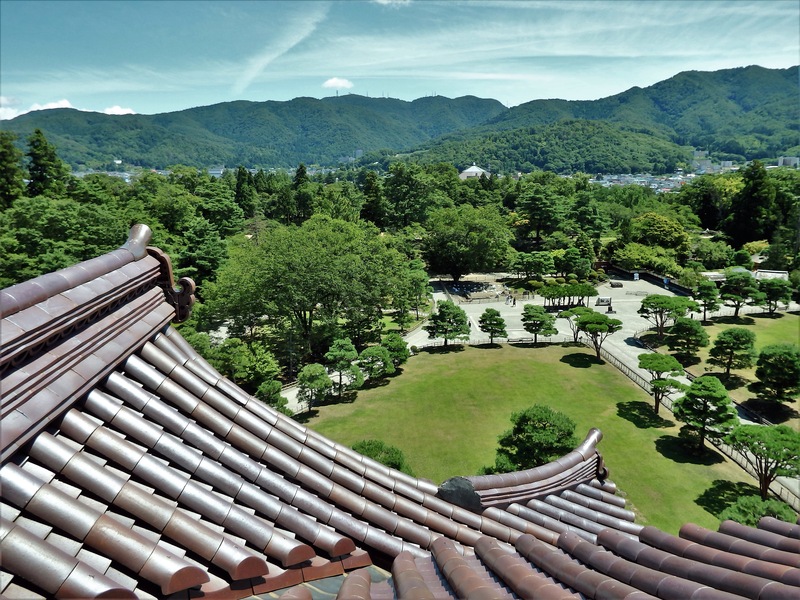 Here is a list (in no particular order) of many of the top things to see & do in Aizu Wakamatsu. 1. 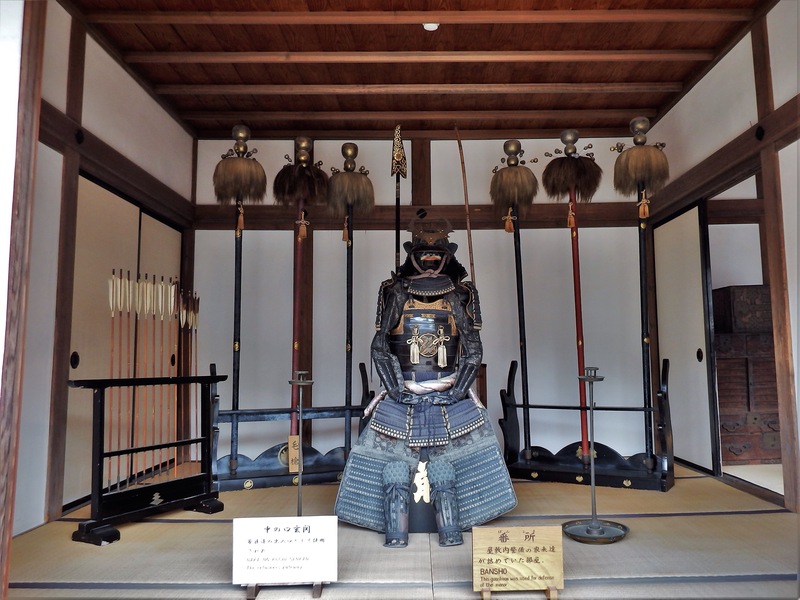 Aizu Bukeyashiki was the residence of a top ranking Aizu samurai, Tanomo Saigo. Although the original was destroyed in 1868, the residence was reconstructed using the original blueprints. 38 rooms are open to the public, as well as a tea house, a mill, an archery range, gardens, and more. 2. Tsuruga-jo is a castle that was originally built in 1384. 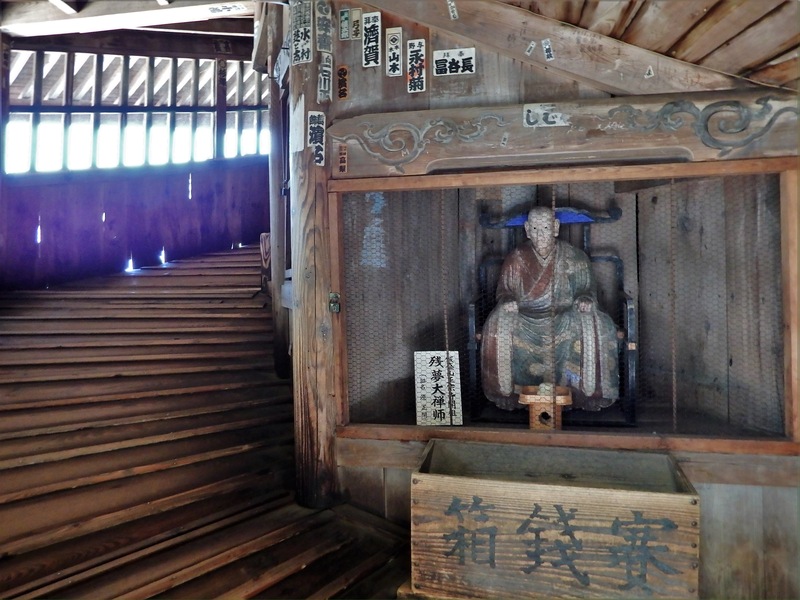 It was occupied by a variety of feudal lords and was one of the country’s last samurai strongholds after the Meiji government took power from the Tokugawa shogunate. The castle was destroyed in 1868 and was rebuilt in concrete in the 1960’s. 3. 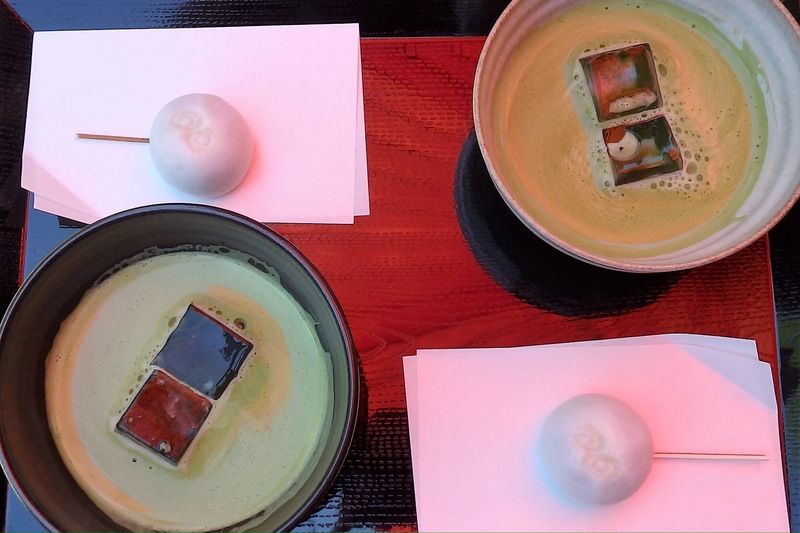 Within the park that surrounds Tsuruga-jo is the Rinkaku Tea Cottage – a tiny garden where visitors can sit and enjoy some matcha & a Japanese sweet. In the summer they serve a very refreshing matcha with ice. 4. 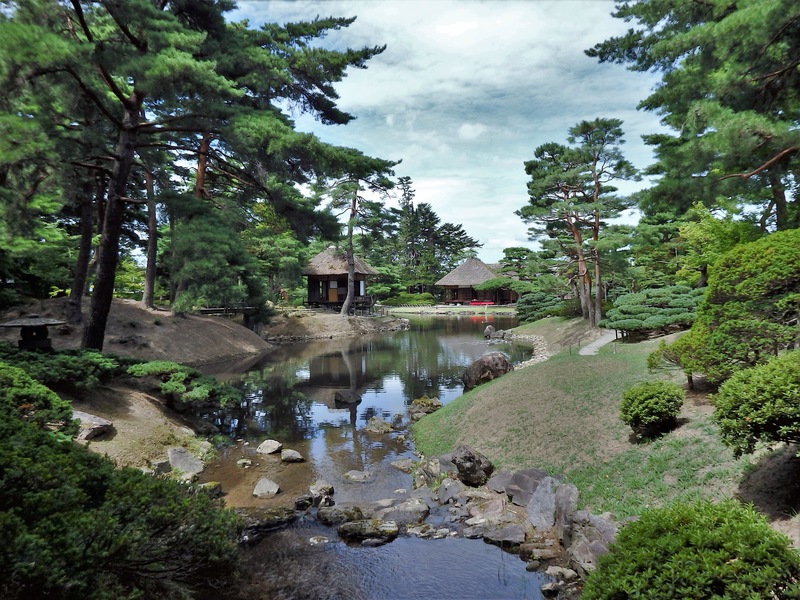 Oyakuen was the garden of the feudal lord, Masatsune Matsudaira, in the early 17th century. A large section of the garden is filled with medicinal herbs that were grown to treat the local community. In addition, there is a traditional strolling path around a central pond. It is also possible to sit and enjoy matcha here. *If you’d plan to visit Tsuruga-jo, Rinkaku Tea Cottage, and Oyakuen, purchase the discount combination entrance ticket. 5. Iimoriyama is a small, 314 meter high mountain that is fifteen minutes by car from Tsuruga-jo. Many Japanese visit to pay their respects to the teenage Byakkotai soldiers who died here in 1868, during the Boshin War. In addition to their graves, visitors can see a small museum, a lovely view of the city, and the Sazaedo, an impressive hexagonal three-story pagoda with a design that allows visitors to walk up to the top, and then down again, without retracing their steps. 6. 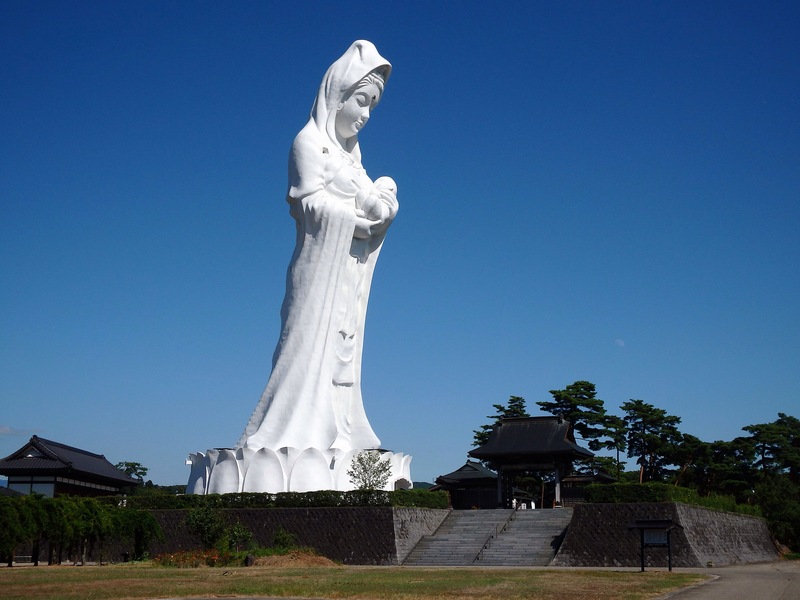 Aizumura, a park just north of central Aizu Wakamatsu, is worth visiting to see its towering 57 meter tall Goddess of Mercy. She looks down over a Japanese garden, an impressive pagoda, and a 14-meter reclining statue of Buddha. 7. Near Aizumura is the Aizu Honko Nisshinkan, which was founded in 1803 as a school for the children of Aizu samurai. The facilities were destroyed in the Boshin War, but have been rebuilt according to their original design. Visitors can tour classrooms, a martial arts training hall, an astronomical observatory, and more. They can also participate in ‘hands-on’ samurai training – in archery, meditation, tea ceremony, etc. 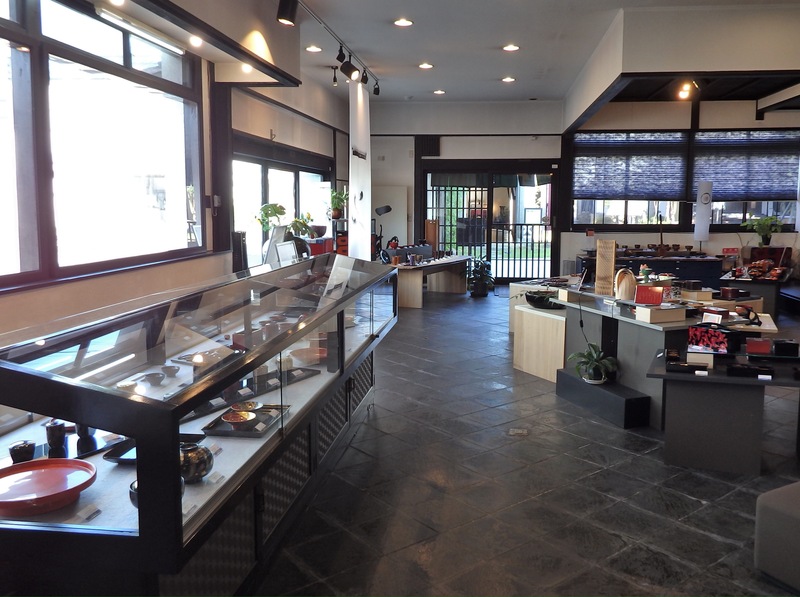 Shopping: There are two items that you should purchase when in Aizu Wakamatsu: lacquerware and sake. 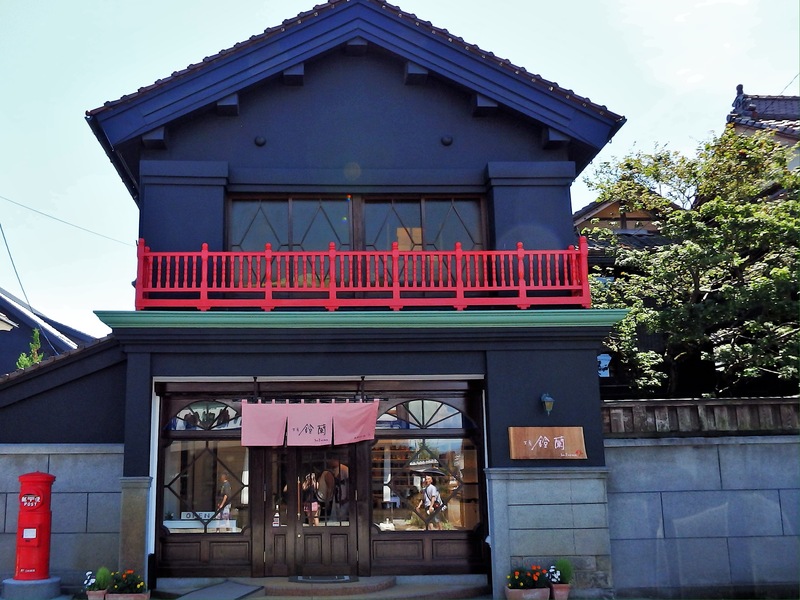 Although both can be found at a variety of locations, I recommend a stop at the Suzuzen Lacquer Shop and Suehiro Sake Brewery & Museum. If you’d like to do more shopping, visit Nanukamachi-dori. This street is lined with souvenir shops that are housed in lovely traditional Japanese buildings. 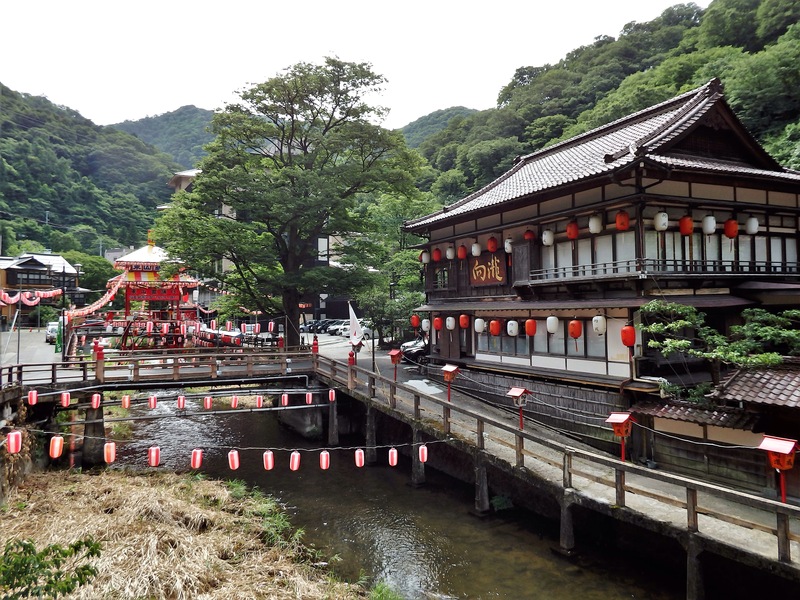 Where to stay: Higashiyama Onsen, a small, hot spring village, is only 10 minutes from central Aizu Wakamatsu. There are about 20 hotel and ryokan to choose from. 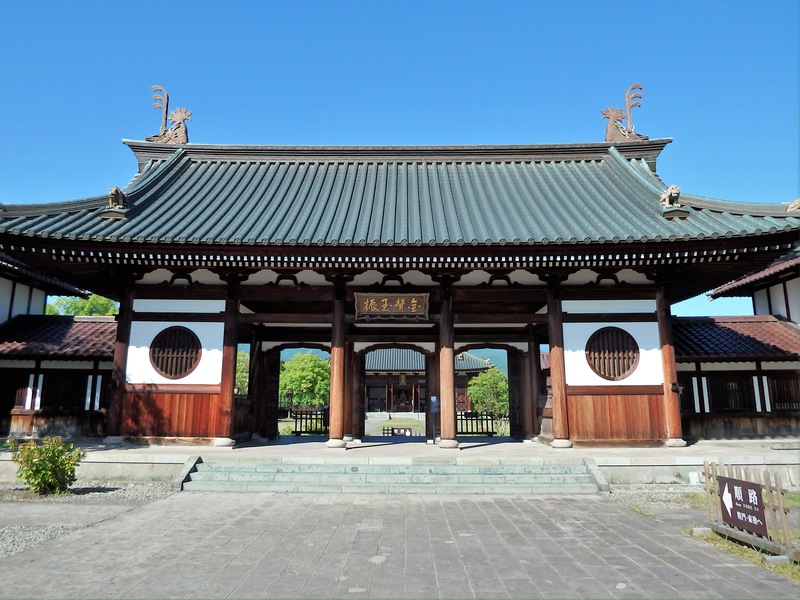 Getting around: Travel around central Aizu Wakamatsu, and its sightseeing spots, by car or the Aizu Wakamatsu Loop Bus. One ride costs 210 yen, and a day pass costs 500 yen. The loop buses operate from 8:00 to 17:30 and depart every 30 minutes. The loop buses pass all of the sites mentioned on this page except for Aizumura & Aizu Honko Nisshinkan (which can be reached by public bus). Getting to Aizu Wakamatsu: The fastest way to get to the city is to take the Shinkansen from Tokyo Station or Ueno Station to Koriyama Station (75 minutes). Then, depending on connections, take the Ban-Etsusai Line or a bus to Aizu Wakamatsu Station. Both take approximately 65 minutes. *If you are a member of TAC, I will be co-leading an ‘all-inclusive’ overnight tour to many of these locations (& famous Ouchijuku – Fukushima’s historic thatched roof village) on October 12 & 13, 2017. Contact me for more information.